Do You Keep Seeing the Same Tarot Card? Tarot cards that repeatedly appear might suggest that you're not listening closely enough. Sometimes a single tarot card seems to follow you wherever you go. This can feel disconcerting, but there's nothing nefarious in the works. In fact, the universe might have a specific idea or journey in mind for you, so it pays to heed the signs. Every tarot card has a specific meaning and purpose, but it isn't all set in stone. When you get a tarot reading, the psychic you work with has his or her own interpretation of each card. This individual perspective will color the spread. It's a little like the law. Every jurisdiction has written laws that citizens must obey, but one judge might interpret the law differently from his or her colleague. Neither judge is inherently wrong — they're both informed by their experiences and personalities. Perhaps a particular card continues to appear in spreads because you haven't interpreted it correctly. Digging into the meaning you or your psychic assigns to the card might reveal a perspective you haven't yet considered. For instance, the Magician card signifies power and forward momentum. However, maybe your psychic specifically associates the Magician with the balance of power in relationships. In this case, the card's reappearance might suggest that you're looking in the wrong place for answers, such as work or hobbies. 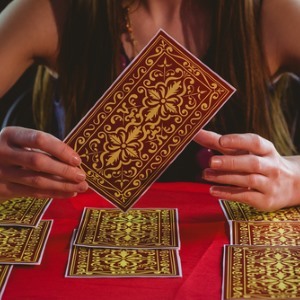 Cards can appear repeatedly in spreads if you're not paying close enough attention during your phone tarot readings. In other words, you heard what your psychic said, but you haven't yet applied it to your life. For instance, if you continually see the High Priestess card in spreads, perhaps you know you should listen to your intuition more, but you're resisting it. Negative experiences in your past could lead you to ignore the card's suggestion, so it continues to give you nudging reminders. When you start a tarot reading, you might focus on a specific area of your life. This doesn't mean that the universe will comply with your wish. Perhaps there's a particular change you need to make or a truth you need to see. Tarot cards might continue to reappear in an effort to get your attention. For instance, maybe you don't need to focus on your finances as much as you think. It's possible that other areas of your life, such as relationships and family, need to take center stage as you navigate your path. Tarot cards can reappear when you're blocked from taking a particular next step. You're incapable of seeing the truth because preconceived notions or emotional baggage are blocking the way. To resolve this issue, you must remove the blockage. Eliminating toxic relationships and opening your mind to new possibilities can help. When you constantly see a particular tarot card in many spreads, you might not know how to interpret it. Use the strategies above to understand what that card means for you and how to resolve any conflicts.